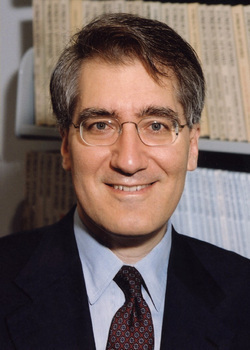 Robert George is the Director of the James Madison Program in American Ideals and Institutions at Princeton University, where he teaches Constitutional Law and Political Philosophy. As a leading scholar of Natural Law, we interviewed him about the role of religion and tradition in the so-called United States Constitutional Experiment. His contribution takes a proper place in the current debate about the relationship between state, religion and society. A. P. : Do you think that religion is meaningful to interpret the US Constitution? R. G.: Yes. The US is a religious Country. It remains a much more religious Country than most of the Countries of continental Europe. And this is not new. The American Revolution was not like the French Revolution. The American Revolution was not an anti-religious revolution. On the contrary, it appealed to the core ideas of ethical monotheism, which are derived from the witness of the Bible. The language of the Declaration of Independence represents an interpretation of the idea from Genesis that all the men are created in the Image and Likeness of God. This is the foundation of the principle of equality - which, in turn, is the foundation of democracy. Democracy is based on the idea that all men are equal and worth of dignity. And they have right to have their opinion taken into account for the formation of the public policy. This is true if and only if human beings have an equal dignity. What is the source of that dignity? The Declaration of Independence says it is because of our Creator - that God created us equal. Again, this is the reflection of the Biblical idea that we are created at the image and likeness of God. We have reason, and we have freedom - we have these powers, which are small but meaningful share in God's own powers. So, the US is truly a religious country, even in the sense that our Constitutional principles are considered the effectuation of the declaration of independence. As late as 1953 Justice William O. Douglas - which is much recorded from the left wing of American politics and Constitutional interpretation - could still say in the decision Zorach vs. Clauson: "We are a religious people whose institutions presuppose the Supreme Being." And this is true. Our institutions presuppose the idea that there is a Supreme Being, a God who is the Source of human dignity and human equality. A. P.: So you mean that Christianity and Christian history does matter, even in policy, right now? R. G.: Yes, of course. But not simply Christian history. It is the Biblical witness. The ethical monotheism. Something which is common to Christian and Jews, and perhaps even to Muslims, although I don't know the Muslim tradition very well. But it is not a specific Christian tradition. US weren't just founded under the preposition that Christ is the Son of God, or that God is three Persons in the Trinity, but on the proposition that there is a Divine Ruler and Judge of the Universe. According to the Declaration of Independence, for instance, there is a Divine Ruler and Judge of the Universe and that we are His children, and share a profound and equal dignity as a result of our relationship to Him. So, all the American policies are supposed to be in line with this idea that all men are created equal, that there is a Creator and that all of us share His Image and Likeness so we own dignity and must be respected, via the political institutions and society. A. P.: Which is the role of tradition in American Constitutional history, in your opinion? Does tradition play some role in interpreting Constitution? R. G.: In my opinion the question touches the sources of Constitution. These are the text, the logical implications of the provisions of the text, the structure of the document, the provisions within the document and its historical understanding. It is in this broad sense - the historical understanding of the text - that tradition plays a role. We look at what was the goal of those who were responsible in making the Constitution. These goals are meant to be the effectuation of the values for the sake of which the Constitution was created and the institutions put into place. In our commitment to understand them, for example, we can consider the "equal dignity of the human person". The Declaration of Independence, which was the founding document of the American regime, says "We hold these Truths to be self-evident, that all Men are created equal, that they are endowed by their Creator with certain unalienable Rights, that among these are Life, Liberty, and the pursuit of Happiness". The Constitution, ratified many years later, was meant to give life to these principles. So our tradition is one of respect to these principles and the role of the Constitution is to give life to them. So our tradition of Constitutional interpretation pays attention of the historical purposes of the Constitution. So this, too, might be understood as a role that tradition plays in the interpretation of our Constitution. A. P.: So which is your opinion about Justice Scalia's approach, who pays much attention to the Framers? R. G.: Scalia is not purported to get into the subjective consciousness of the Framers who ratified the Constitution, but rather to recover what was understood, at the time of the ratification by all those who deliberated and participated in the debate on the particular provisions of the Constitution, should be ratified. That attempt to recover the understanding is itself something difficult and is a matter of tradition: the historical understanding of the text and the meaning of the text of the Constitution. So I think this is the role for tradition. We also have a common law tradition, which has an impressive difference from continental European systems. Tradition inside the tradition: this is the idea that the decisions can establish a tradition, which should be respected even if decisions in the first instance are not entirely correct. On 30 November 2008, Theologian William C. Placher died. 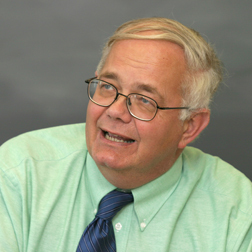 He was the LaFollette Distinguished Professor in the Humanities at Wabash College and a prolific writer. I never met Dr. Placher but reading his works I felt I knew him; Placher was a constant companion for countless scholars in theology. Given that today's feast is of a saint who brought thousands to Christ, I thought reprinting a recent article about a rather high profile baptism this past year. It is no small thing that a Muslim accepts Jesus Christ as his Lord and Savior and lives to tell about it. Magdi Allam's story is unique. 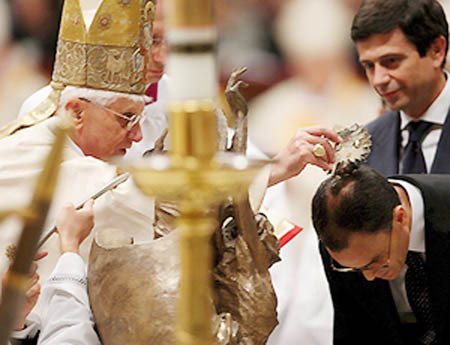 The high-profile baptism of Magdi Cristiano Allam at the Easter Vigil ceremony presided over last year by Benedict XVI has a story behind it. According to Allam himself, his conversion journey was possible because of great Christian witnesses. One of the directors of the Milan daily Corriere della Sera, he spoke about his conversion and the experiences that led to it when he met with university students of Rome last week to tell the story of his path to Catholicism. 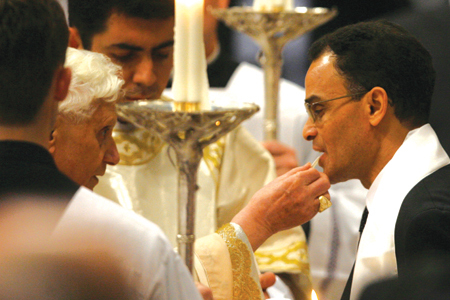 Starting from the Easter Vigil of 2008 -- which Allam called the "most beautiful day of my life" -- when he received baptism from Benedict XVI in St. Peter's Basilica, the Italian-Egyptian journalist spoke of his life journey and the reflections that brought him to embrace "a new life in Christ and a new spiritual itinerary." "This journey," he recalled, "began apparently by chance, [but] in truth was providential. Since age four, I had the chance to attend Italian Catholic schools in Egypt. I was first a student of the Comboni religious missionaries, and later, starting with fifth grade, of the Salesians. "I thus received an education that transmitted to me healthy values and I appreciated the beauty, truth, goodness and rationality of the Christian faith," in which "the person is not a means, but a starting point and an arriving point." "Thanks to Christianity," he said, "I understood that truth is the other side of liberty: They are an indissoluble binomial. The phrase, 'The truth will make you free' is a principle that you young people should always keep in mind, especially today when, scorning the truth, freedom is relinquished." The journalist continued: "My conversion was possible thanks to the presence of great witnesses of faith, first of all, His Holiness Benedict XVI. One who is not convinced of his own faith -- often it's because he has not found in it believable witnesses of this great gift. "The second indissoluble binomial in Christianity is without a doubt that of faith and reason. This second element is capable of giving substance to our humanity, the sacredness of life, respect for human dignity and the freedom of religious choice." The journalist affirmed that the Holy Father's 2006 speech in Regensburg -- which caused uproar within the Muslim community -- was for him a reason to reflect. 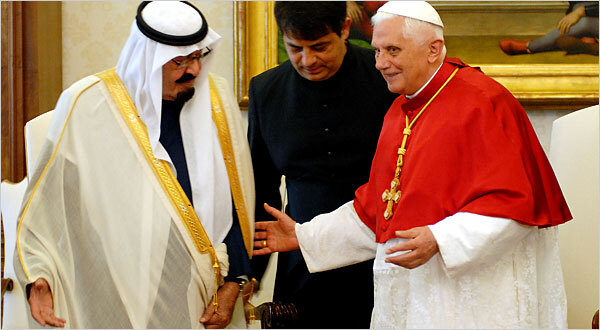 Allam said: "An event, before my conversion, made me think more than other events: the Pope's discourse in Regensburg. On that occasion, citing the Byzantine emperor Manuel II Paleologus, he affirmed something that the Muslims themselves have never denied: that Islam spreads the faith above all with the sword." He added: "There is a greater and more subliminal danger than the terrorism of 'cut-throats.' It is the terrorism of the 'cut-tongues,' that is, the fear of affirming and divulging our faith and our civilization, and it brings us to auto-censorship and to deny our values, putting everything and the contrary to everything on the same plane: We think of the Shariah applied even in England. 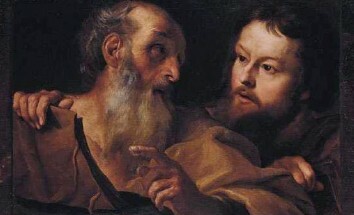 "The one called 'a great one,' that is, to always give to the other what he wants, is exactly the opposite of the common good, perfectly indicated by Jesus: 'Love your neighbor as yourself.' That evangelical precept confirms for us that we cannot want good for the rest if we do not first love ourselves. The same is true for our civilization. "Contrary to that principle is indifference and multiculturalism that, without any identity, pretends to give all kinds of rights to everyone. A result of multiculturalism was the imposition of social solidity and the development of ghettos and ethnic groups in perpetual conflict with indigenous populations." The journalist recounted: "This led me to consider the third great binomial of Christian civilization: that regarding rules and values, a key for a possible ethical rescue of modern Europe. The old world, nevertheless, is a colossus of materiality with feet of clay. Materialism is a globalized phenomenon, unlike faith, which is not." Responding to a question about a possible compatibility between faith and reason in Islam, Allam contended that "unlike Christianity, the religion of God incarnate in man," Islam is made concrete in a sacred text that, "being one with God, is not interpretable." "The very acts of Mohammed, documented by history, and which the Muslim faithful themselves do not deny, testify to massacres and exterminations perpetrated by the prophet. Therefore, the Quran is incompatible with fundamental human rights and non-negotiable values. In the past, I tried to make myself the spokesman of an Islam moderate in itself." Regarding interreligious dialogue between Christians and Muslims, Allam said that it is possible only "if we are authentically Christian in love, including toward Muslims. If we make dialogue relative, we will instigate our questioners to see us as infidels, and therefore as land to be conquered." The journalist emphasized for the students the importance of an education that goes back to transmitting "an ethical conception of life, with values and rules at the center of everything." A negation of such principles, he contended, "is wild capitalism, which, paradoxically, has its maximum development in communist China." "We cannot conceive of the person in 'business' terms," he concluded, "and we have to find rules of co-existence that are not founded on materialism. We should redefine our society based on being and not on having." The Catholic News Agency reports that the founder of the Italian Communist Party, Antonio Gramsci, reverted to the Catholic faith before his 1937 death. Why is this important? Gramsci's version of communism in Italy was a bit more sophisticated than that of other countries. One central difference is that while communism wanted to kill off the Catholic Church Gramsci's method was to do so from within by persuading Catholic families to renounce their faith and to get the clergy to slowly reject matters of belief and practice which would impact life in the Church and in culture. His was a brand of "cultural hegemony," meaning that one can reduce faith, reason and culture to ideology. The reduction of faith, reason and culture is also a reduction of personhood, in virtue and values, a reduction of human dignity, work and beauty which eventually lead to nihilism. A person can't thrive in a system where life is built on false premises and therefore, life is lived without meaning and seriousness. Saint Therese of the Child Jesus, pray for us! This page is a archive of entries in the Faith & Reason category from December 2008. Faith & Reason: November 2008 is the previous archive. Faith & Reason: January 2009 is the next archive.